Take a good look at your favourite album, movie or even the expensive smartphone in your pocket – there’s a good chance they were copied, sampled and assembled from someone else’s original idea. Whether it’s a drum sample, a cinematic technique or the refinement of a technology, according to New York filmmaker Kirby Ferguson, everything is a remix. When you start to think about it, he’s got a point (and that’s before you’ve even watched the videos below). Most “progress” is tied to the advancement of an idea, concept or even technology. 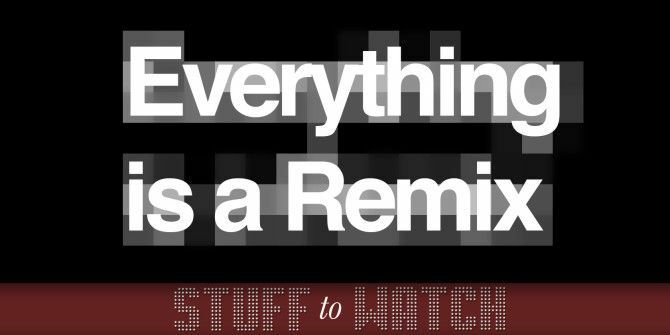 With so many people contributing the greater good, how can everything not be a remix? If this fascinates you as much as it does me, Ferguson’s four-part documentary will be right up your street. In the first part of the series Ferguson explores the origins of the word remix, which has its roots in the emerging hip-hop scene of the late 1970s. Before this, artists were certainly using other people’s music, though it fell into two categories: covers (credited versions of existing songs) and knock-offs (copies, not different enough from the originals to be considered new). Led Zeppelin fans may want to look away as Ferguson picks apart some of the band’s earlier hits as badly-disguised knock-offs, including the intro to one of their biggest commercial successes, Stairway to Heaven. The film certainly doesn’t demonise Plant and Page, though, as the point of the documentary is to demonstrate the prevalence and importance of the “remix” in society. Lazy, big-budget filmmakers are notoriously bad for reusing tired old formulas. It’s as if the theme, set and characters are interchangeable while the rails that support the whole show are cast in concrete. That’s before you’ve even considered the number of adaptations, re-makes and spin-offs of novels, stories and TV series already in existence. Instead of Led Zeppelin, this time round its Star Wars being subject to the “spot the original” treatment, with its many similarities with Flash Gordon (like the opening credits), western and war films that came before its time. Again, Star Wars is not under “fire” here, as Ferguson says: “creation requires influence”. Part 3 demonstrates how very few revolutionary products would exist without a culture of borrowing ideas and existing technology. Copying in this context doesn’t mean “ripping off” by creating a 1:1 carbon copy and passing it off as your own, but taking a design and improving it to the point where the resulting product is significantly better. The case study features the Xerox 8010 and Apple’s Lisa and Macintosh computers. Oft-told is the tale of how Apple “stole” Xerox’s mouse pointer, but they didn’t stop there. They “stole” a bunch of other ideas too – like using a graphical interface that used windows. Then Apple went and made a large number of their own changes, which helped the Mac succeed in the consumer marketplace (though the $2,500 price tag was cheap for the time, and probably helped). Finally we arrive at the difficult topic of copyright, on the one hand necessary to protect the creator’s interests and on the other a locked door in the corridor of progress. Initially these conditions covered a brief period of time in which work would be protected from copying, allowing the creator to cover the associated costs before work is released to the public domain. The effect the market had on this idea was profound. All of a sudden ideas were property – intellectual property, to be precise – and the idea that most of us are ok with copying, provided we’re not the ones being copied. And then there’s the issue of lawsuits and patent trolls, who exist solely to acquire patent libraries and have a few good days in court. Few devices arrived on the smartphone front with quite the bang that the iPhone had in 2007, and even the iPhone is the product of remixing. Steve Jobs was unashamedly honest about stealing ideas, despite being quoted in 2010 calling Android a “stolen” product. This brand new addition to the Everything is a Remix series looks at the iPhone, and how the technologies that made it so revolutionary The Rise And Fall And Rise Of Apple: A Brief History The Rise And Fall And Rise Of Apple: A Brief History The success of Apple indeed lies with their attitude of "Thinking Differently". While the company may not have always been heralded as a success, their strength over the years has come from great vision and... Read More were borrowed, refined and have since probably been copied all over again Is Everyone Ripping Off Apple's Designs? [Opinion] Is Everyone Ripping Off Apple's Designs? [Opinion] Apple's products all have a certain look to them. Steve Jobs and Jonathan Ive wouldn't have it any other way. The question is whether everyone is ripping off Apple's designs at this point in time... Read More . If you’ve enjoyed this short series then you’ll probably enjoy listening to Ferguson’s TED talk 8 TED Talks Videos Under 5 Minutes Long You Want to Watch 8 TED Talks Videos Under 5 Minutes Long You Want to Watch Have five minutes to kill? What better way to spend that time than to watch an fascinating or informative TED Talks video. There's a lot of great content available to watch on TED but sometimes... Read More too. Much like the five films above, Ferguson backs up his claims with examples (this time round it’s Bob Dylan) and explains his theories behind creativity, “copying” and the concept of a remix. You can follow Kirby Ferguson on Vimeo, on his blog or check out his new project This Is Not A Conspiracy Theory. Did you enjoy Everything is a Remix? How do you feel about software patents and intellectual property? It is a truism in programming/software design that there have been only a few original programs ever written. They were created at the dawn of the computer age, back in the 1940s and 1950s. All other programs written since then are just variations on a theme. Programmers are forever slicing, dicing, re-arranging and re-using existing code. Microsoft borrowed the GUI from Apple which borrowed it from Xerox PARC. MS-DOS is a re-write of QDOS which is a re-write of CP/M-86 which is a re-write of CP/M-80. "They “stole” a bunch of other ideas too – like using a graphical interface that used windows. " Tim, you make it sound like Apple stole the idea of graphical interface from Microsoft. (Most people associate "windows" with Microsoft). Many non-computer people are still ignorant about how Apple's G.I. came first and Microsoft followed. Maybe you are not geeky enough yet? After all, your Ferguson's TED link of 30 minutes ago is already not valid. When I said Apple stole a bunch of other ideas like using a GUI that used windows, this had nothing to do with Microsoft or Windows the product. In fact, Windows the product came after this. Apple took the idea of a GUI from Xerox, then Microsoft licensed it (for one version) and then used it ad infinitum (without licence). And I'd love to hear how the TED talk posted at the end of the article is somehow not valid? Excellent article Tim, I really enjoyed reading it!